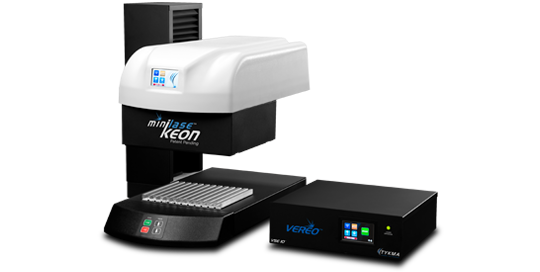 Minilase Keon™ takes laser marking innovation to the next level. A revolutionary, patent-pending design provides users the flexibility to mark both small parts and large parts. A four-sided collapsible power shroud provides a protected Class 1 marking configuration. In addition, with password protected control, the system can be switched to a Class 4 workstation for large or irregular part configurations. The sliding track system permits the safety shroud to move to the rear of the machine allowing full access to the large T-slot work surface. The system comes equipped with a laser control rack and an integrated touch panel interface for laser control. A secondary touch panel display on the front of the laser system provides constant machine feedback. A USB connection to a laptop or desktop PC is all that is required to start programming with our Minilase™ Pro SE laser marking software. Quickly mark text, barcodes, serial and date codes, graphics and more. Utilize our micro or full size rotary device in Class 4 mode for 360° radial part marking. setup and marking within minutes.